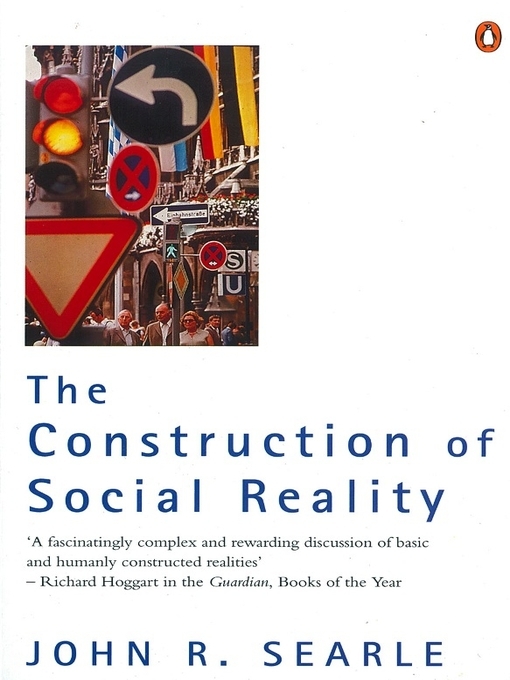 Given the subject matter, John Searle’s The Construction of Social Reality is an accessible book, and well worth reading. So: (i) a notion of representation that relies on the existence of ‘the world’ is set up and implemented. (ii) notions of ‘realism’ and ‘anti-realism’ are set up and implemented that rely on the world existing independently and dependently of representation, respectively. (iii) the case is then made that much of our normal understanding and discourse already presupposes realism, and are unintelligible in it’s absence. (iv) the onus is then shifted onto the shoulders of anti-realists, who are now called on to replace ‘normal background understanding’ with an alternative that would make anti-realism intelligible. My issue is this: if you’re going to hang the notions of realism and anti-realism on the independence or dependence of representation on ‘the world’, then obviously you’re already buying into a realist ontology – not because of reliance on ‘normal understanding’, but because the very criteria by which you propose to swing the argument already appeal to such a thing as ‘representation’, which in turn appeals to such a thing as ‘the world’. “in no way dependent”!? Searle’s own example sits uncomfortably with me. “Snow or ice”, you say? So is this white stuff that I’m pointing to, right here on the summit of Mt. Everest, snow or ice? What’s that you say? “It depends on where we agree to put the referential boundary between snow and ice.” If the disambiguation between snow and ice, between mountains and ridges, etc. requires social agreement – which it does – then something feels wrong to me about the claim above. Meanwhile, we’re supposed to accept that a $5 bill buried in the ice on top of Mt. Everest is no longer a $5 bill in the absence of representation. Whether or not there is a mountain, whether or not it has snow or ice near its summit, and whether or not the piece of green paper buried in there is or is not a $5 bill are all questions whose answer – like the answer to any question – relies on social agreement. Maybe I want to say that there is something there in the absence of representation, but that it is impossible to say what it is without representation. What’s happened here, I think, is that Searle (consciously or unconsciously, I’m not sure which) buys into functionalism: to him, for a certain class of entity, function plays an important role in rendering its identity, in determining what it is, and in some contexts apparently even determines whether or not it is even existent. An ontological distinction is made, with ontologically objective and subjective entities respectively characterised by the absence or presence of function. This is why a $5 bill ceases to be a $5 bill, in his system, if all representation suddenly ceases – it’s simply because for him, $5 bills rely on functional criteria to be called $5 bills, and if those functional criteria are suddenly no longer met (because we wipe out representations, or humans, or both), than voilà – the green piece of paper blowing in the stillness is no longer a $5 bill. Snow, on the other hand, is not called snow by virtue of its role in snowball fights. There would still be snow if snowball fights never existed, qua Searle.